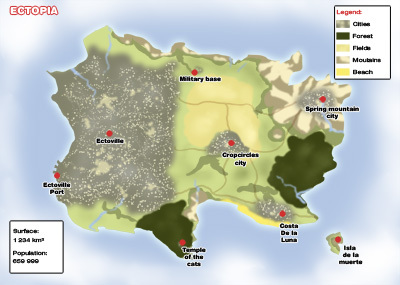 This is a map of Ectopia (click to enlarge). That’s where the girls live. Ectopia, an island lost in the Bermuda Triangle and always surronded by a strange fog that prevents radars, planes, or ships from finding it (except incidents, we KNOW that happens). The island was colonised 200 yrs ago by shipwrecked english and french people . They founded the first city: Ectoville and a well organised civilisation. Ectopia seems to attracts all the odds and anomalies that happens on Earth, it also means what humans call « monsters ». It’s the only place where they can have a « stable » life and where they are…Accepted. The island have all a population needs; fields, cattle, water springs, and also forests, a beach, and mountains. Ectoville is a very modern and advanced city: It has shops, factories, schools, a univeristy, they have their own TV and radio studios, a subway…Well everything you can find in a big city. Costa de la luna: A resort beach, ideal for holidays. Spring mountain city: water springs and holiday resort. La Isla de la muerte: well it seems that a lot of deads buried on the ground of Ectopia come back to life…They had to build a cemetary on that small island nearby…It’s a holiday…For eternity. The temple of the cats: An old temple where lives cat peoples. That’s where Cath and her sons goes for training. It’s rumored that one of the temple is actually a warp gate to India.